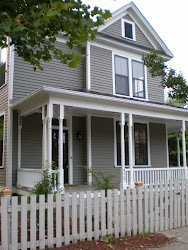 The Pink Elephant: Our beloved first home in Oakwood for RENT! Our beloved first home in Oakwood for RENT! $200 if you can help me rent our house. Available for move in Nov 1 after we freshly paint some of the interior. The house is 1800 sq ft, 2 bedrooms, 2.5 bathrooms with spacious kitchen, dining room and den. 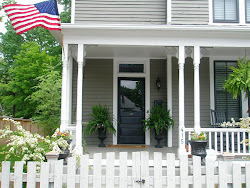 Charming Oakwood home with fabulous wrap around porch and white picket fence. 5 minute walk to downtown and Glenwood Ave. Big bonus is driveway in back with off-street parking (rare in Oakwood!). Fully renovated kitchen and bathrooms with granite countertops and SS appliances. Master has large walk-in closet which includes a window. Master bath has double vanities and tub shower. Guest bathroom has glass walk in shower and single pedestal vanity. Guest bedroom also has double doors for another good size closet that's so rare in historic homes. Basement and attic provide additional storage space. Tiled mudroom off back entry with separate laundry room attached (washer and dryer included!). Pets can be considered with pet deposit. The little dog that photobombed a lot of my old pics is not included, but I would throw in the den rug (black and floral). Let me know if you'd like any other details and if you or anyone you know would like to take a look. We absolutely loved living in this house and looking at these pictures makes me miss it! You can comment below or send me an email whitney.c.otto@gmail.com. I just sent you an email inquiring about more details. Your house is beautiful. Thank you!